This is the town where we have built a mini-chocolate factory. 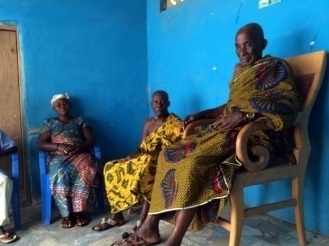 The picture is of the chief, his mother, the spokesman, and various senior officials. We are asking the chief for the privilege of locating a chocolate factory in his village. We have donated over $10,000 of tools related to the manufacture of chocolate to Frami. We are hoping to work with ProWorld based in Abuja (20 minutes to the south) to create opportunities for students to get involved.